Wolf Like Me by TV on the Radio is part of the album "Return to Cookie Mountain" and comes under the genre Rock,General. It was released on 12 Sep 2006 under the label of Interscope. Copyright holded by (C) 2006 Touch And Go Records. 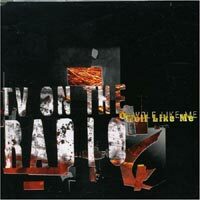 'Wolf Like Me' is the first single from the TV on the Radio album 'Return to Cookie Mountain', released in the United Kingdom on July 25, 2006 on 4AD Records. The single's B-side was the song 'Things You Can Do', which was also available as a bonus track on the U.S. release of 'Return to Cookie Mountain'. It was released in two formats, CD single and 7' vinyl. It is a tribute to Howlin' Wolf. The song is the band's most successful single in the United States, where it peaked at #37 on the Billboard Hot Modern Rock Tracks chart in 2006. In January 2010 it is being used in a TV commercial by Nike to promote the 2010 Olympics. The commercial is called Destiny - Force Fate. Wolf Like Me Lyrics are the property of the respective artists, writers and labels. These lyrics are provided for eduacational purposes only. Please buy the song if you like them.